Vienna Card Review- Worth it or a Waste of Money? | Travel? Yes Please! The Vienna Card- Worth it or a Waste of Money? A lot of cities nowadays offer tourist cards, a card you purchase that gives you discounts to popular attractions, activities, and even transportation. We’ve bought these cards in a few places- some are great and have saved us a lot of money, while others have not been such a good deal. For our trip to Vienna, we decided to give the Vienna Card a try, even though we weren’t sure if the Vienna Card was worth buying. Having now used the Vienna Card, we wanted to share our experience and review of the Vienna Card to help you decided if it’s worth buying for your trip. What is the Vienna City Card? The Vienna City Card is the official Vienna Card that offers tourists free use of public transportation, plus discounts on admission fees, tours, shopping, restaurants, and shows. We had not done any research on the Vienna City Card before buying it. The first time I heard of it was when I was booking our hotel and saw an option to purchase it. I’ve used cards like this in other cities and had good experiences with them, so we went ahead and bought it without really knowing what we could get from it. On the surface, the Vienna Card is probably the most comprehensive tourist card we’ve purchased. When you buy it, you get a coupon book listing more than 200 discounts/benefits available to Vienna Card holders. There were discounts for museums, tours, concerts, cafes and shops. Wow! Sounds great, doesn’t it? 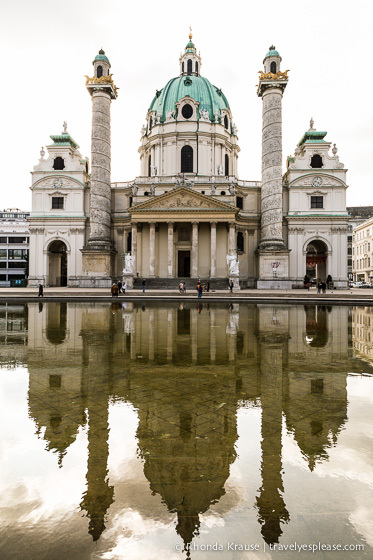 The baroque Karlskirche (St. Charles’ Church). As I flipped through the booklet, I started to realize that most of the discounts were for things we had zero interest in seeing/doing/buying. The few places that we were interested in visiting, offered a very small discount. In fact, most of the discounts were nothing to get excited about…one euro, a surprise “gift”, a free drink. Some discounts were even less than a euro! Not feeling like we were getting our money’s worth, we started going out of our way just to try and use the card. But it was a hassle, especially when it came to the restaurants. We didn’t feel like searching out these places just to get a free drink or save a euro or two. When I’m hungry, I want to eat right now, not wander the city looking for a place to use a coupon. We ended up eating at TGI Friday’s, of all places, just because it was the closest place where we could use the Vienna Card. The Vienna Card redeemed itself a little with me when it came to transportation. The card gave us unlimited travel on all public transportation for 72 hours. Since our hotel was not in the centre of town, we used the metro a lot to get around. We left Vienna feeling like we got ripped off, so when I got home I sat down and did some calculations to see if our feelings were justified. The Final Verdict: If we did not buy the Vienna card and had to pay full price for all our activities and transportation listed above, it would have cost us €66.75/person. With the Vienna Card discounts and included transit pass, we spent €45.77 each. Now factor in the €19.90 cost to buy the Vienna Card and we spent €65.67/person. So in the end we saved €1.08 each. It is worth noting that we could have saved another €3.oo on our Schonbrunn Palace concert tickets had we not bought from a shady salesman. The salesman was selling tickets inside the palace and when I asked if we got a discount with the Vienna card, he said no. I was sure I saw the concert listed in the book, but I didn’t have it with me to double check. When I looked it up back at the hotel, I was not happy to see that we were lied to and could have saved some more money. So, it turns out we did save a little bit of money with the Vienna City Card. If we were interested in visiting a lot of museums, we would have got more value out of it. Should You Buy the Vienna Card? That’s a personal choice and one that should be carefully researched. If you plan on doing tours and visiting a lot of museums or other places listed in the book, then it might be a good buy. But if not, you might spend your trip going places you weren’t initially interested in visiting, just to get your money’s worth. Would We Buy the Vienna Card Again? In hindsight, I wouldn’t have bought the Vienna Card because we had to consciously make an effort to go places just to use it. I didn’t like searching for restaurants where we could use the card and wouldn’t have eaten at TGI Friday’s if we hadn’t been trying to make back our money. I much prefer city sightseeing cards that include free admission to the main attractions, rather than just a discount. A good example of this is the Paris Museum Pass because it’s more straightforward and specialized, rather than trying to be something for everyone, like the Vienna Card. City cards that include free admission, instead of various discounts for a range of places, make it easier to decide if you will save money buying it. My biggest problem with the Vienna Card is that it’s not clear (or quick to figure out) how much you will save by buying it, since the discounts at each place are so different. You need to have a strict itinerary planned in advance to figure out if the Vienna Card will save you money. The 72-hour Vienna Card costs €29.00 and is valid the date you write on the card plus the following three days. There also is a 48-hour Vienna Card available for €25.00, or a 24-hour Vienna Card for €17.00. The transit pass you get with the Vienna Card is valid for 24/48/72 hours from the time of validation. You can use it on all public transportation services (underground, trams, buses). You can buy the Vienna Card online, at hotels, the tourist information offices on Albertinaplatz, in Vienna Main Station, and the airport. The Vienna Card is not to be confused with the Vienna Pass, another sightseeing card. * Information was correct as of February, 2019. Please confirm directly with service providers. Purchases made through the included links earn us a small commission, at no extra cost to you, and help support this website. Thank you! For your convenience, here is a list of hotels in Vienna. Please consider booking your Vienna accommodations through the included link. It costs nothing extra and helps support this website. Thank you! Sonia Sahni - Great post! Whether to buy the card seriously depends on what you want to do. We bought the card In Stockholm…and was worth every cent! The Travels of BBQboy and Spanky - Nice to know, we’ll be in Vienna in 2 days. Maybe I’m not a frugal traveller, but I hate buying discount cards, having to read through it, plan what we want to do — just to save $5 in the end. Not something I would buy.